Some quiet thoughts : Reflections: 2011- The year that was! 2011- The year that was! Warm greetings to each one of you. It’s that time of the year when one spends time reflecting and looking back - hopefully with a heart full of gratitude and thanksgiving. We are overflowing with thanks to God our Father for His countless blessings that he keeps pouring into our laps. We are ever aware of His mercies being new every morning and His faithfulness that is beyond measure. It makes our hearts full of praise and worship for this fantastic God we serve who is good and upright in all that He does. Praise be to Him forever and ever! The year 2011 has been a year of being stretched on every front. Lets begin with the family. ANDREW:This year has been a biggie for us as Andrew was in his final year at school and appearing fro his ICSE (year 10) examinations. I think it was a huge growth phase for him, in trusting God, exercising faith and pressing on. He did well in his exams and we are proud of him. The next hurdle was getting admission to the right college. The way the Lord led us was most amazing to say the least! Torn between two very good colleges, both of which we were confident of getting admitted into, we did not want to face the burden of choice. And God spared us just that by delaying the Admission list of one ( the one which ought to have come out first) and by bringing forward the list of the other college which should have come out after the other! It always amazes me how He makes our paths straight! Not only that - God provided for us to pay the premium fees when we were greatly lacking at that point in time. Andrew is enjoying his college, continues to grow and is now standing 6.3 feet tall!! He enjoys playing his drums at church, college and other Christian events. Our JESSICA is 10 years old this year - somewhat a watershed in her life as she will never be in single digits again! She continues to excel in her studies, music and art. She won the English elocution competition in school, got the first place for the 100mt sprint and the 1st place in her class in the Computer Olympiad at school. She is making good progress on the keyboard and is adept at handling the DLP and laptop during worship at Church. Both children bring much joy to our hearts and we are grateful for all the talents God has blessed them with. We, completed 20 years of life together on the 22nd of December. God has been more than kind to us. We have had a wonderful journey together serving the Lord for 17 years of our married life. In these years God has worked things out only for our good. His good and mercy have always surrounded us. We have learnt and are still learning to walk by faith and not by sight. We are learning that His ways are not our ways - he measures success by a yardstick of faithfulness and not how the world see it ( sometimes even the Christian world). We are learning and continue to learn that Christ is the only unshakeable rock- everything else is passing and shakeable. We look forward to spending many more years together and in His Majesty’s service. Both of us have been using our gifts more widely. I (Colin) have been involved in training and teaching the Word in different churches. Navaz has been using her gift of writing to write and Blog : www.somequietthoughts.blogspot.com. She has also stepped out in song witting. You can listen to them on Youtube: www.youtube.com/user/navazd/videos. These are amateur steps but as we are faithful in little we believe God will give us more. What can we say? Except that Jesus is building HIS church and the gates of hell will not prevail against it. 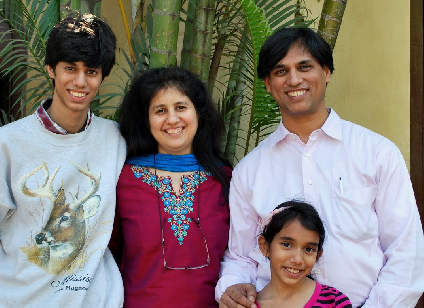 June 2012 will mark 10 years of us coming to Pune and starting Word of Grace. We came alone - just us and two small children. We laboured hard and long and battled for the first fruits for 7 years!! We had to face the fact that Pune being a transient city with very high mobility - we were working in a challenging situation of a turn over of over 30% every year. So we would pour ourselves into people, train them, raise them up only to find them up and leave some times in as short a time as 6 months! In the last two months,we lost two of our key men( Vinoth and Mnason) who were with us for a little over 2 years. Having trained them to take much responsibility in the church it was heart wrenching to see them both go in a span of a month due to job transfers. This challenge is ever before us. So in these years we have given away a least half a dozen trained men! And we start all over. But that is not what we want to focus on. We believe the tide has indeed turned and this year we have seen great growth on many fronts. So what are these areas of growth? We have seen the Lord add to our numbers . We started this year with about 40-50 people and are closing this year with 90! God has been good. We are in faith for us to cross 150 soon. Many are hearing the gospel for the first time. Others who come from traditional Christian backgrounds find themselves confronted with the grace of God which they find irresistible, refreshing and liberating. This year we started a training program called InDepth Discipleship which was held every month . We had trainers come from different parts of India. An average of 17 people have been on this training this year and have greatly benefited from it. This is the first year we have been able to have “Life Groups” in more than one location. Through it an average of 40 people have been able to connect with each other through the week. Finance - the church has grown in giving. We want to thank God for sustaining us over these 10 years where we have been self supporting for the last 7 years despite our small numbers. This year we got a fantastic Gift Day Offering that was taken toward development of Word of Grace and giving toward other Church plants and works among the poor. We have grown a good worship band where worship is the focus and not performance. A new worship leader in Joyce has been raised up. Navaz has felt released to write many worship songs and they have been sung and well received by the congregation. Sunday school - is slowly beginning to take shape. While having teachers is still a challenge the children are enjoying it and are being impacted. We see this as a very important segment of the church and need to give to better attention. Serving - We still recall the days when the serving team comprised of myself, Navaz and Andrew while Jessica sat in her stroller! Today we have a whole group of young men and women willing and serving. We thank God for each of them. Trainee - This is the first year we have a young man, Austine, train with the church. He is a part time trainee who helps out with the administration and is being mentored by Colin. His growth over this year has been evident to all. Spiritual Gifts - We are beginning to see people exercise the gifts of the Spirit by bringing prophetic words, pictures and praying for healing. Answered Prayer - We have begun to realize a special grace anointing upon us as we pray together. We have seen barren wombs opened, finance released, jobs obtained, houses purchased and changes in the city as we have prayed together. Leadership - This year we have had 4 people ( Vinoth, Manson, Sunny and Joyce) consistently lead the devotions, breaking for bread, administer the Offering apart from myself. They have been able to handle the Sunday meeting in my absence ( while I have been away on Trainings etc). This has been a significant area of growth as it released me to bless the wider body of Christ and has been of great value to themselves. ( However, this has now been greatly affected with Vinoth and Manson having moved to Bangalore). Blog and media- We have started a church blog called http://wordofgracechurch.blogspot.com/ which has been widely read and is having an influence beyond the local church. Both Navaz and I have been given an opportunity to write for a Christian magazine on a regular basis. We feel this is a God given opportunity to influence the expression of Christianity through the articles we write. As you know , we are involved in tent making ventures to sustain our stay in Pune. ( We do get a salary from the church but that is not sufficient to keep up with inflation and ever rising cost of living). Our heart has been one of never wanting to be a burden on the church, rather, to bless her in every way possible. Over the last 9 years of doing business we have found ourselves walking on water most months. We can only speak of God’s grace and provision to us as a family each month. The recession in the West has taken its toll on out business. Our Greeting Card venture is now producing and selling only 25% of what it used to. The result is where we gave employment to 5 people we now employ on 2 people for only 3 months in the year. While we have seen God’s ever faithful provision, we have not been able to sustain employment for these poor people. Our Printing ventures have also face many challenges with freight and paper costs going up and printing costs in the UK falling. We are grateful to those of you who still continue to print with us. We would like to remind you that each time you print with us you help us stay financially afloat, and self sufficient without being ( like the apostle Paul has also said) a burden on the local church. As we have taken a hit in both these businesses, I have been forced to look at other avenues to generate income for my family. God has been good to us and other avenues are opening up but it means a lot of time away from the church and family and this too in a critical time of church growth. So we want to tread with wisdom and caution as we do not want to be distracted from our main objective, which is the church. We would appreciate prayers for this. We look forward to the new year with much anticipation for greater things and want to take leaps of faith like never before knowing God is on our side. We have also been sensing for a long while that this is a season and time for drawing closer to the throne room of Jesus - into His presence in worship and prayer - that is where all the battles are fought and victories won. As we do this we know that God will add strength to us . We want to be faithful in continuing to make disciples, while we leave the building fo the Church to Jesus. We pray ever blessing upon you and your family, and your work. Word of Grace Church is not only special to me but also a vital part of my walk with God. Though now am no longer physically with this Church or with my elder brother Colin, yet this Church is close to my heart. I trust God to make amazing provisions & opening many new doors in 2012. Just as the Word of God says, "No eye has seen, no ear has heard, nor mind has conceived what God has prepared for those who love HIM", I believe that Colin, Navaz, Andrew & Jessica would be living testimony to this verse in 2012. Wherever we were I feel connected to church and Colin's family. Wonderful year 2011 as we received so many God's blessings through Church and we became blessing to others life by church trainings and Colin-Navaz personal counselings. They are so like a family and we miss them. Thanks to the Church and pastor family for the support while we were in Pune. Delighted to read this blog. Thrilling to hear how well the children are doing and also church numbers ... wow!